Before moving to their current location on Toronto’s Queen St. West, 3D-printing retailer Selftraits didn’t have an official POS system. This meant they wasted valuable hours on admin, manually entering sales and customer data and opening themselves up to costly mistakes. They realized that in order to grow the business, they needed a POS able to deftly handle those back-office tasks and to provide them with accurate, easily exportable data. So they began their search for the perfect POS, which eventually led them to Vend. Read our interview with Marketing and Events Coordinator Jake Cooper to find out why Selftraits chose Vend! Tell us a little about yourself, your business, and your local community. What’s Selftraits all about? 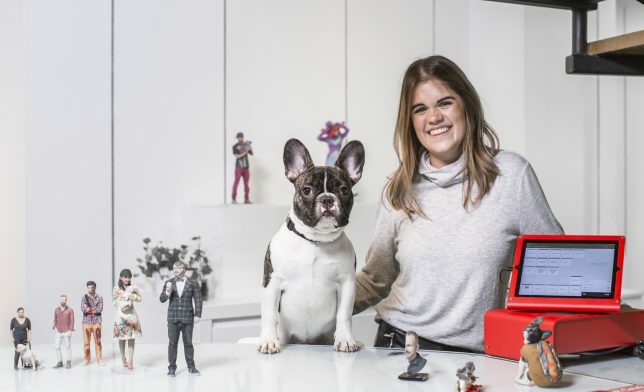 Launched in June of 2015 as a subsidiary of the 3D printing company Objex Unlimited, Selftraits was developed as a consumer-friendly way to immerse the public in the world of 3D printing. Using our state-of-the-art 3D capturing and printing technologies, we’re able to produce industry-leading 3D-printed figurines. Whether it’s with a figurine of yourself, a loved one, the entire family, the office, or even your pet, we provide our customers with an experience and a keepsake like no other. Since moving to Queen St. West in December of 2015, we’ve had the pleasure of scanning many thousands of people both in studio and at events! Before we moved to Queen St. West, we had no official POS system in place. Transactions were manually recorded into Excel from receipts, and customer data was imported manually into our CRM software. Manually entering sales and customer data can open up a world of issues. Spelling mistakes, miscalculations, and other human errors were becoming a problem, and it just wasn’t a scalable solution for our business. If we wanted to grow, we needed to implement an all-encompassing POS system that was user-friendly, tracked sales numbers, set goals, and kept an organized database of our customers. We were also beginning to allow customers to gift Selftraits in the form of gift cards — but we had no official gift card-tracking system in place. We began printing vouchers with preset amounts, but these were ineffective both because we couldn’t track them and because most people wanted to customize their gifts to include different product options. Since most of our employees don’t come from a retail background, we needed a POS software that anyone could pick up and use at a moment’s notice. Vend’s easy-to-use platform and overall user-friendliness quickly transformed us into retail experts. With Vend, we can view our sales numbers; set targets; export customer data; and (most importantly) complete a sale with ease. Before Vend, only a few of us were keeping track of sales numbers, but with Vend’s user-friendly dashboard, our employees can now identify both our sales numbers and targets. From a marketing perspective, the ability to seamlessly export customer data into our CRM has allowed for more targeted campaigns, which has led to an increased amount of return customers. The ability to clearly view and export accurate data has been our biggest win by far. Gone are the days of calculating our sales receipt by receipt or manually typing a customer’s email into our CRM. Being able to access the register remotely has been great, especially when we’re out of town or if we’re working from our printing (Objex) facility in Etobicoke. The ability to view sales reports at a moment’s notice has allowed us to always be on top of everything. Being a small business, time is always of the essence. Implementing Vend into our daily transactions has transformed Selftraits from a fun side project to an efficiently run business. Also, time we once allotted toward manually importing data is now put into developing marketing campaigns, curated content, window displays, and other endeavors that help drive sales online and in-store. Follow Selftraits on Facebook, Instagram, and Twitter, and visit if you’re in the Toronto area. The post Vender of the Week: Selftraits appeared first on Vend Retail Blog.